Trade-barked by dogs. Optimal protein & fat levels for senior dogs. 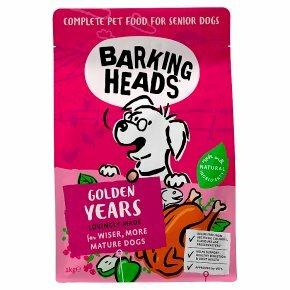 Specially formulated for older, wiser dogs. Extra joint health. Healthy digestion. Balanced nutrition. Approved by vets for senior dogs. Good Shopping Guide - Ethical Pet. Ethical Award - The Ethical Company Organisation. What's in the bag? Only good stuff... like Chicken and Trout, Brown Rice, Oats, Garden Veg, Fruit, Herbs, Vitamins and Minerals... for happy, healthy senior dogs. Everything you need to feed a happy, healthy senior dog Made with natural ingredients Free from artificial colours, flavours, preservatives and GM ingredients - and that's a promise!? ? While our recipes are 100% free from artificials, they are made in a factory that handles artificial ingredients. Extra Joint Health Fortified with extra Glucosamine and Chondroitin to support and maintain ageing hips and joints. Healthy Digestion Packed with highly digestible protein and low GI carbohydrates. Balanced Nutrition Optimised for muscle maintenance and weight control. Approved By Vets Endorsed by veterinary professionals throughout the UK.